INTERIORS & GROUNDS: A spacious living room with a fireplace & the kitchen have large glass doors leading to a vine-covered veranda which offers a shady spot for relaxing with tremendous views of rolling hills & distant villages. You can enjoy long al fresco meals on the Spacious Veranda(12m x3m) which overlooks the private pool & the beautifully tended gardens.Broad lawn full of roses, perfumed by lavender & rosemary bushes, surrounds the house and leads down towards a paved terracotta terrace with an alluring Pool with Whirlpool area, where loungers beckon to sunbathers & you can sit with your laptop & send photos of the sun setting behind the hills to your friends via the villa’s Wi-Fi. GROUND FLOOR: Spacious fully equipped Kitchen with dining table;large Living room with fireplace,both of which Air-conditioned. Spacious veranda with tables & chairs, hall, 2 baths with shower, pantry. FIRST FLOOR: 4 double Air-conditioned bedrooms; 1 small room with balcony; 1 bathroom with bathtub/shower. TODI: 5 miles away from the villa, is the old town of Todi, founded by the Umbrians (some cite the date 2700 BC). Situated in ancient times on the border between the Etruscan and Umbrian territories, not far from Rome and Florence, Todi has been defined as the most livable town on earth, the 'ideal town' by research of the University of Kentucky for its size, its climate, its hilltop location and for its harmonious relationship to its surroundings. A striking artistic centre in a magnificent position dominating the Tiber valley, celebrated for its Roman and Etruscan remains, for its palaces, its churches and its atmospheric medieval environment. Picturesque winding streets, stone buildings, medieval wells, arches, sudden ascents and descents that create various perspectives and dramatic views of faraway valleys, hills and mountains all contribute to Todi's unique appeal. From the moment we arrived, we felt at home in this delightful villa. The setting was idyllic...overlooking a typical Umbrian scene with the lovely pool in the foreground and surrounded by carefully tended and beautifully planted gardens. Our host Rosa was a delight! An accomplished cook and generous in her attention to detail, making sure at all times that we had everything we needed make our stay even more special. The location was perfect and we would highly recommend this villa to anyone!!! I couldn’t have chosen a better place to celebrate my 70th birthday with my family. I did a lot of research beforehand to find the perfect place and I certainly found it with Villa L’Arco. It was ideal for us as I didn’t want a party, just wanted to be with my family and have a week in Italy that I would remember for the rest of my life and I certainly did that. There were 6 adults in all and the villa was extremely spacious as shown in the Homeaway photos so there were many places you could just relax by yourself and have a nap or read a book. Lots of lovely walks to go on too. The property is in a beautiful, peaceful, rural setting, olive trees and fruit trees everywhere, very homely, immaculately clean and well maintained. It’s very close to the town of Todi which is a lovely little town, certainly worth seeing. There is a large supermarket not far from the villa so we were able to stock up on food as soon as we arrived. They had everything we needed. It was still quite warm while we were there so the beautiful pool was well used, especially after a day of touring around. Rosa, the owner was excellent and was always nearby and available if we needed anything and she even helped me find a doctor when I developed a sudden medical problem. In addition she spoilt us with some of her home baked treats. It was a lovely surprise to return after a day of touring a find Rosa had baked something for us. On my actual birthday we took advantage of Rosa’s offer to prepare a dinner for us at the Villa and what a wonderful feast it was. For dessert she made an incredible Tiramisu which was to die for. Thank you Rosa for everything! We will never forget the week we spent in Umbria and certainly hope to return one day. Just a shame Australia is so far away! We have just enjoyed our 2nd fantastic stay at this excellent villa. We are a family of 4 with 2 teenage sons and we all had a very relaxing and extremely enjoyable week here. Villa L'Arco is set in the most peaceful and relaxing location you could wish for but is also only a 10 minute drive to the huge EMI supermarket which stocks everything you could ask for and does some very high quality food as well as all the basics. Todi itself is about a 15 minute drive and parking is easy as we used the car park at the bottom of the hill before you enter the town. The usual small railway/lift to the town was out of action this time but the local authority had laid on a minibus to the top which seemed to be available every 10 minutes or so at most. Brilliant. Our favourite restaurant in Todi was Le Scalette, which is down a few steps off of the small road leading tho the town centre. Brilliant food with great variety and friendly service. We were given an outside table with fantastic elevated views of the surrounding area on each of the two occasions we visited. Back to Villa L'Arco....this really is an amazing place to stay. The pictures speak for themselves and are an accurate description of the facilities. Everything is very clean and well maintained, the air conditioning throughout is very welcome and the pool is perfect. Our favourite place was again the veranda where you can sit looking over the beautiful gardens, pool and surrounding hills. Whether enjoying a game of cards, reading or having dinner outside on the lovely warm evenings, sitting at the table on the veranda is just perfect. And finally our host, Rosa. You couldn't ask for a happier, more friendly, hard working and helpful owner. Always on hand if you need anything but never intrusive. Rosa, thank you once again for another perfect holiday. It was lovely to meet you again. The two dinners you made for us were again perfect and as for the cakes, it really is very hard to decide which was the best ! Thank you. We highly recommend Villa L'Arco and look forward to staying here again in the future. The pictures on this site are lovely, but in reality it is even more beautiful. The area is idyllic. Hard to ask for more peace and tranquility. Our 'host' Rosa was so very welcoming and kind. We lost count of the beautiful home baked cakes she would drop by with. The villa is stylish and large. Lots of space and sunlight. The gardens are meticulously kept and the pool is great. We received a warm welcome, and treats from Rosa, who was a wonderful source of support when a family crisis occured. The villa is delightful and is immaculately maintained. Villa L'Arco was an ideal getaway. Set in the hills surrounding Todi at the end of an unpaved path it provided a luxurious retreat for our week long holiday. The property is spacious with 4 double bedrooms and 3 bathrooms. Plenty of room downstairs and beautiful grounds with a private pool. The views of the rolling hills are great to wake up to. The dark skies give great star gazing opportunities. If it's too hot outside then there is the option of AC at an extra cost. Ideal for us as it was 38C for the first few days we were there. There is free broadband throughout the house which is also accessible from the pool area. It stopped working the first day we were there, but Rosa got it fixed within the day. The owner Rosa lives close by and is very friendly, kindly dropping off home baked cakes on a couple of occasions. 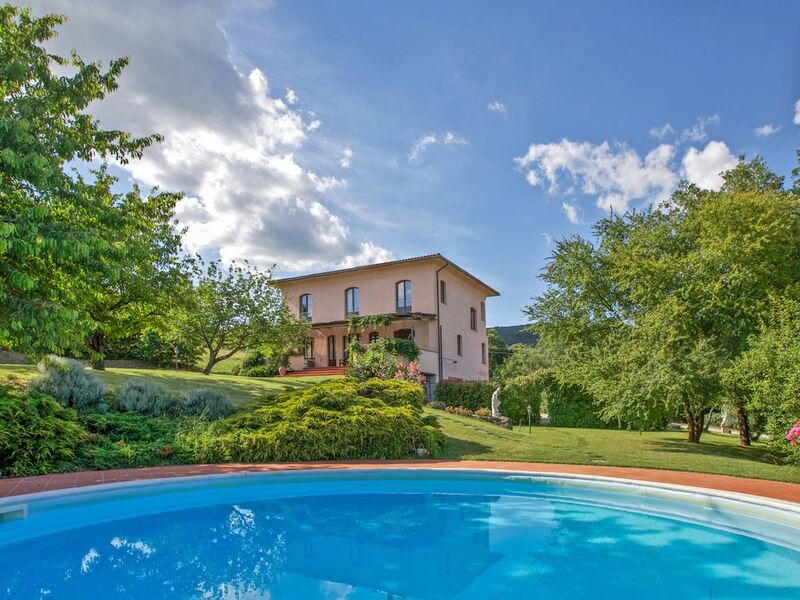 The villa is a short drive from the picturesque hilltop town of Todi and only an hour and a half from Rome. Also within easy reach are Lake Tarsimeno, Perugia and Assisi. There is a large supermarket within about a 15 minute drive too. Villa L'Arco is situated 5 miles from Todi and stands on the hills around the river Tiber, surrounded by olive-groves, vineyards and its own woodland with centuries old oak trees. In addition, thanks to the central position in Umbria,close to TUSCANY,you need only get onto the main road, which is just 2 miles away and the finest towns of artistic interest in Italy are within easy reach: it takes only 40min by car to get to Assisi, Spoleto, Orvieto and Perugia. Rome 90min, Florence 120min. ---MAIN DISTANCES in miles: Todi 5miles- Deruta 13ml- Assisi 34ml- Orvieto 22ml- Perugia 25ml- Spoleto 25ml- Spello 40ml- Gubbio 45ml- Rome 80ml- Siena 90ml- Florence 118ml- Pisa 160ml- Lucca 168ml- Naples 205ml- Venice 220ml. --- A I R P O R T S : Perugia 23miles- Rome 93ml -Florence 118ml - Pisa 160ml. NEW: for those coming from the UK, there is a DIRECT FLIGHT, LONDON STANSTED- PERUGIA S.EGIDIO, which is at HALF AN HOUR FROM THE VILLA by car , the flight is operated by Ryanair. INCLUDED IN THE RENTAL PRICE: Wi-Fi, Weekly change linen & towels;Gas; Electricity; Water & Tap Hot Water; Pool & Garden maintenance; Maid service 2 hours at midweek; Helpful owner-caretaker in separate house. SERVICES UPON REQUEST: Air Conditioning €20/day; Heating €40/day;Additional Maid Service €15 per hour. Welcome dinner or in the week €35 per person (min. 4) RENTAL CONDITIONS: Final Cleaning of Euros 150 are due at check-in + Euros 600 of Security Deposit in cash. Security Deposit against breakages will be refund at check-out.